The topic of building strategy that is alive and real, that is not an indulgent document that is a result of an annual ritual is a topic that stays on the minds of many. Be they entrepreneurs, social leaders, corporate executives and anyone with a set of objectives to move forward with. More on that in just a bit. How do you introduce someone who has been making a difference to a growing community in a rather quiet, matter-of-fact manner? In a world where the decibel levels of raw marketing are perpetually set to ‘maximum’ examples of people who let their work do the talking is becoming rarer, Kimberly Bain and her work stand out. So when the opportunity of working closely with Kimberly Bain came up, we at the India Chapter of the International Association of Facilitators, we were delighted. To put it mildly! Kimberly is an expert facilitator and works with both small and large groups ( 5 to 500) to help them reach consensus and achieve a common purpose amongst other things. She has a vast portfolio of experience, facilitating community groups, professional, volunteers, academics, hospitals, medical professionals, government departments and stakeholder groups. Her style is inclusive and works on building consensus. Something that our fractured times so need. Her innovative approach to strategic planning, expert conflict resolution techniques combined with her varied facilitation toolkit get her to work with varied groups across the world. Her recent book the “The Reflective Practitioner : becoming a reflective ethical facilitator” made it to to the Amazon best sellers list is fast becoming a seminal resource for facilitators all around the world. My conversations with her have been diverse, as she gets to do a bit of exploration of India. Her thinking on strategy and her approach to conflict resolution perked my ear. Read on. Am sure you will learn a thing or two. Me : What are the components of strategy making and where do you see organisations / leaders struggle with? Kimberly : Strategic planning is about focusing for success, this requires careful and insightful planning on how to develop the Strategy, who to involve, the processes to ensure best thinking is included and all options and opportunities are considered. Many thought leaders know that the Strategic Planning Process is almost more important that the resulting Plan itself. While most leaders understand this, they do not always have the background and information needed to design a planning process that meets their needs, the needs of the organization and the needs of the people who will be executing the Strategy. Utilizing the art and science of facilitation can provide the guidance needed to custom design a Strategic Plan that is based on collaboration to produce sustainable outcomes, therefore building the buy-in needed within the organization to move employees from thinking to action and from paper to implementation. Me : How does facilitative style of leading people augment a business leader’s skillset? What must a leader do to bolster that? Kimberly : In order to develop and utilize an effective facilitative leadership style, leaders need to understand behavioural analysis, group decision-making processes, individual communications styles and conflict handling styles. In order to bolster individual facilitative leadership we need to learn how to make the job of those who we lead “easier”, by facilitating their work, their relationships and expand their ability to innovate. Me : A degree of conflict is inherently needed for progress and growth. Now is this true, from your experience? How do leaders get to foster this? Kimberly : That depends how you define “conflict”. Creating an environment where individuals can voice and explore different opinions, alternative points of view and unconventional thinking does help groups and organizations grow and progress. But “conflict” often is a result of poor communication, negative assumptions of intent and lack of trust. Me: Inclusion (or the lack of it) can break the best of strategy. In a world where young people across the world want to participate in the decision making process and want to have their voice heard, what is the next frontier of strategy making? 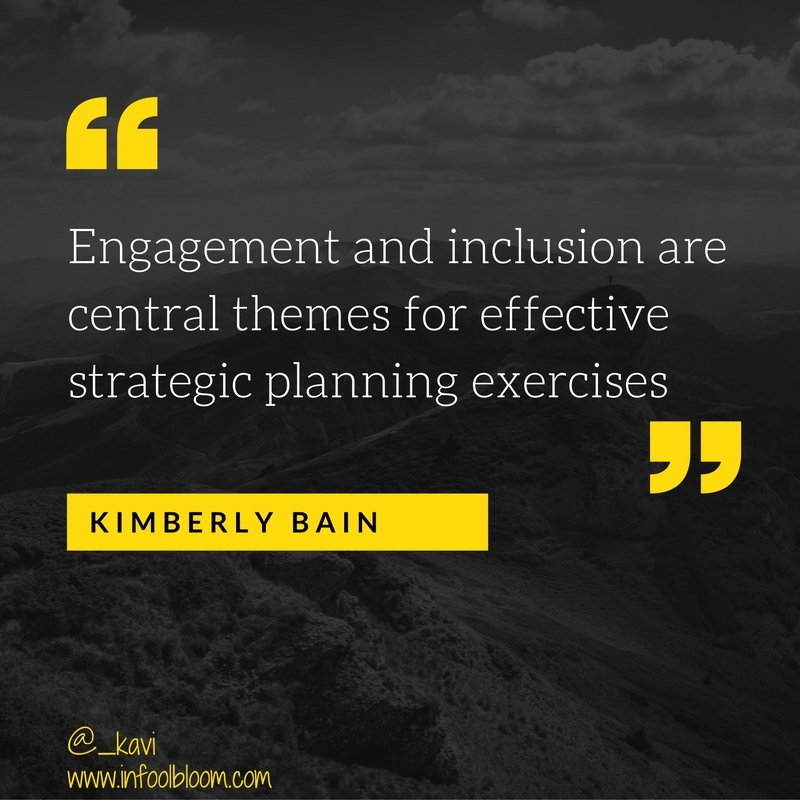 Kimberly : Absolutely, engagement and inclusion are a central theme for effective strategic planning exercises. Not only is this necessary for social enterprises and community-based strategic planning, but it is just as important for profit-based organizations to include staff, shareholders, stakeholders, partners and customers in their Strategic Planning. This ensures all views are considered, all options are explored, and most importantly, champions and cheerleaders are created throughout the organization, making implementation smoother and more effective. When people feel like they have been involved in the decision, they will not only support it, but they will advocate for it! Me : Could you share an experience in helping a team with making of a strategy that has stayed with you. Kimberly : I worked with a Government Agency in Canada. This was a new Agency that was created to help coordinate Cancer Control efforts across Canada. The Agency had no actual authority over health departments across the country, so they needed to develop a Strategy that would position them as the hosting agency convening crucial conversations to help coordinate effort and increase impact. Canada has 13 different provincial health departments and I assisted the Agency to design a Strategic Planning process that brought together each province, the various national and provincial cancer advocacy groups, agencies and thought-leading clinicians. The process took 9 months and was extremely successful. The 5 year resulting Strategic Plan was so effective that the Agency received a second 5 year mandate and is considered the main reason that cancer mortality rates have decreased across the country! Kimberly is leading a two day session on Strategy Alive in Mumbai on the 26th, 27th of August. An opportunity for business leaders and facilitators to come together and explore. More details and FAQs are there on the Facebook events page as well. Dive in folks. It will be a fantastic investment of your time. For those readers in Bengaluru, Kimberly will be leading a half day session on the Tao of Facilitation. The event page is here. Facilitation. Now, that’s a much abused word. There was a time when anybody with a PowerPoint deck, platform and a set of participants came to think of themselves as great trainers. Gradually, as ‘training’ in itself became less ‘cool’ and perhaps as a need to distinguish themselves from others who had gotten on to the ‘training’ bandwagon, it became fashionable to call oneself as a ‘Facilitator’. So much so, in several circles, ‘training’ and ‘facilitation’ are interchangeably, and without the slightest of pauses! That topic for another day. 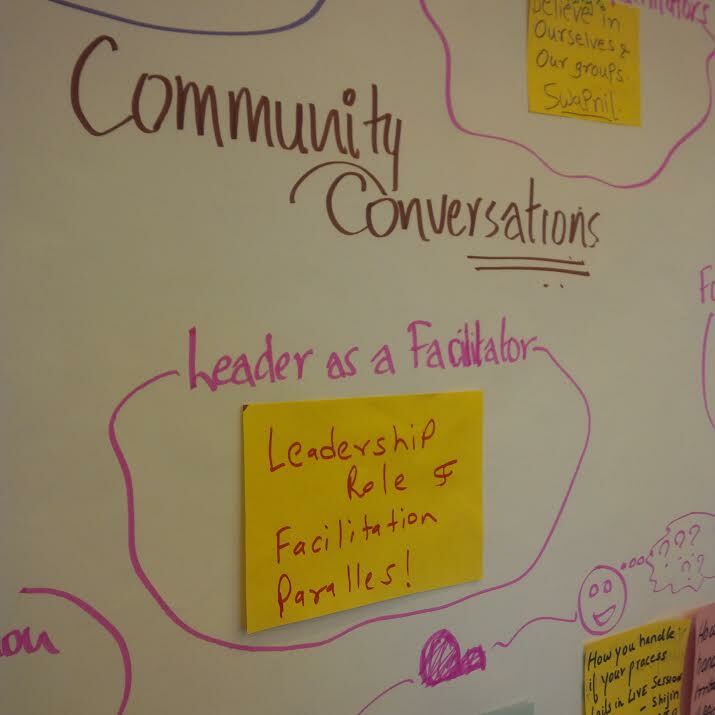 It was in 2011 that I got to experience deeper insights into what facilitation is. Or can be. I recall, very vividly, how a bunch of committed people from Japan demonstrated their response in mobilising public support and action, after the Fukashima nuclear disaster. It was mind blowing, to say the least. At one level, it was facilitation skills at play. But at another level, it helped me see a coming together of people with passion, with a singular objective of wanting to make a difference to a population. There was no commerce. No forking of brands in the name of CSR. It was just a committed bunch of people wanting to make a difference and do their bit. It was deeply humbling. Since then, I have listened to stories and understood designs about how Facilitation helped brokered peace between countries or between warring factions of an apartment complex to bringing change within corporate contexts. ‘Facilitation’, I realised, was more dynamic and had potency to affect larger communities and conversations. Far beyond corporate walls and narrow problems. It was action. Inclusion. Participation. Mutuality. And a respect for one another. The feeling that we are all in this together. There was no pedestal to stand on and ‘address’ the group. I was hooked to the International Association of Facilitators. It occurred to me that to be able to stand before a group of people (sometimes in the 100s) and getting them to do their work, helping them work through their dilemmas is as raw as it can get. And more importantly having fun in the process. 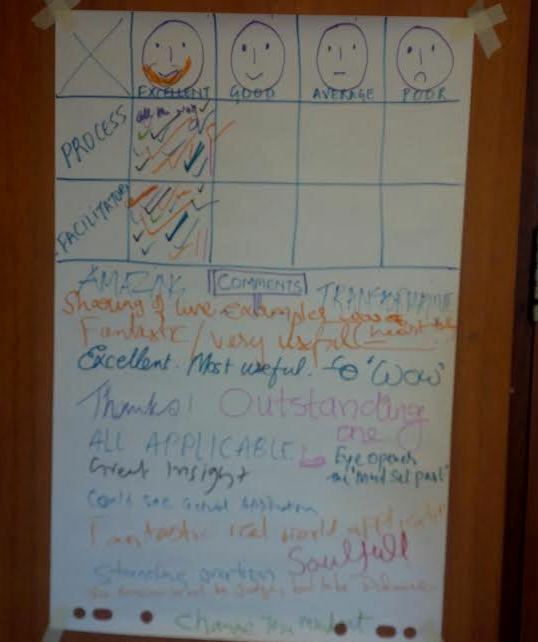 After playing with facilitation in different settings since then (here is a post from last year), I am more than convinced that if it is one skill that community leaders, entrepreneurs, development workers, business leaders, leave alone HR practitioners, need to learn really well, it is facilitation. There is a ton of material available about what it is and what more you could do with this.. The International Association of Facilitators is leading the charge worldwide. IAF Conferences are quite unlike any other conference. They are intimate participative experiences that draw the best out of people in a fun filled effortless way. Riding on a feeling of togetherness and community. Plus there is a committed bunch of people working relentlessly to help the community move forward. Facilitating a conference on facilitation! There is one conference that I make it a point to be around, it is the India conference of the International Association of Facilitators. For a variety of reasons. For one, it is a brilliant community with loads of equanimity. For another, there is no question of sitting back, staring at a deck of PowerPoint slides, slickly produced corporate videos and listen to suave speeches or a panel discussion, which is the staple fare of most other conferences. Nothing wrong with that. Just that, the IAF conferences require active co-creation, reflection, and meaning making as an integral part of every minute. IAF events are truly immersive experience for everyone in the room. Never a dull moment. Perpetually inclusive and trusts the wisdom of the community to keep it moving along. That is a rich wisdom and I have always been enriched after each meeting! To share, learn and grow with the community is a narrative that is dear. We (Me and the L&D team from Asian Paints) were there this time around too, to share our experiences with facilitation, but more importantly to co-evolve along with all participants, a ideas and thoughts alongside our experience. a. The detachment that is necessary from labels & tools and in order to attach ourselves to outcomes seemed to resonate with many. The ‘lightly-tightly’ way of working. There were several models that got built atop that vector. b. Every tool has a place and needs to be respected for that. Overuse can undermine, and under use can be a travesty of what is possible if that tool too had been used. Training, Facilitation, Coaching etc are different tools. ( Tools that carry different meanings in the minds of many). Attachment to outcomes, can bring about a focus on interplay and ownership. c. Questioning of assumptions can alter the dynamics of how the future (and organisational processes like ‘reviews’) can be differently built. To begin working on a problem as its stated, but to enable reframing of the ‘problem’ by all stakeholders, with imagination, can cause considerable shifts. We shared a couple of examples, the group constructed a few that were neat. d. Of course, there were multiple rounds of discussions on ‘dismantling the hierarchy’ and the imaginative ways of co-creation that can be enabled by simple sharing and ‘letting go’. I would reckon the ‘letting go’ bit is a difficult but necessary pill (if it were to be one), for outcome effectiveness to reign. e. We had begun by getting the group to imagine ‘all interactions’ within an organisation. The choices made by random diverse groups reiterated to me, how common organisational dilemmas are. And more importantly, for how long they have been around. We need new ways of working with and resolving these dilemmas. The old ways don’t work, for they were meant for an old time. And of course, we ourselves are new. Another feature of IAF Conferences is the open, transparent way of gathering and collating feedback. 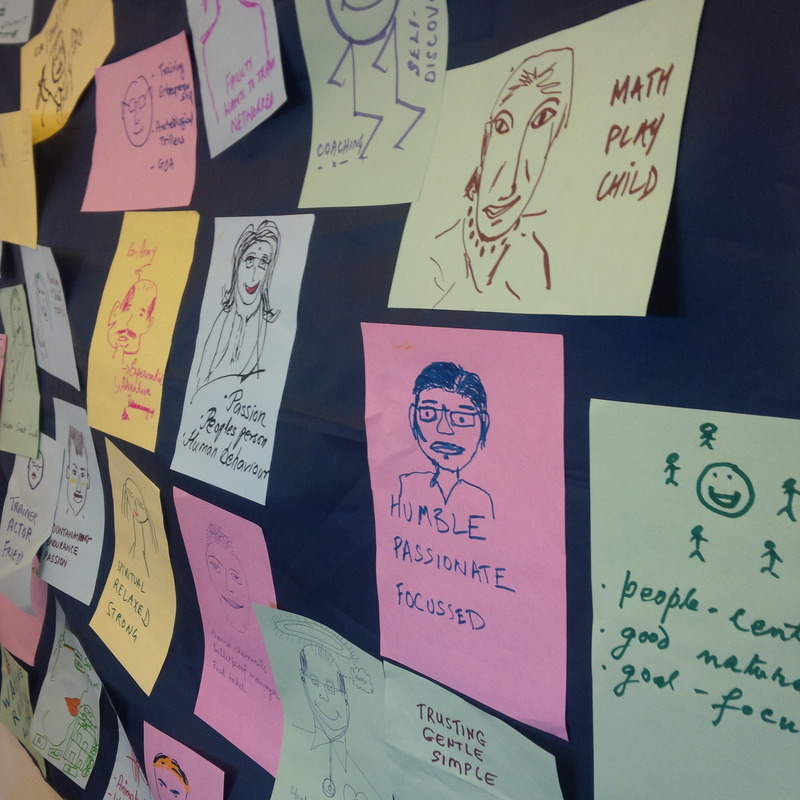 What you see above was feedback sheet of participants from our session. It left me smiling, while serving as a pointed reminder of the work to be done. The world and the #FutureOfWork, need an inclusive approach to life, living and work. The foundations of ‘facilitation’ stretch far beyond a clutch of skills. It presupposes an inclusive, generous, mindset that is not bound by ‘control’ but lead by ‘a letting go mindset’ and get everybody to take responsibility. It is a key skill to imbibe and get proficient with, for now and the times to come. With an emphasis on community, common ground and development. Skills to stitch together the future in the face of ever widening differences, are critical. Now, more than ever before. It was in 2011 that I first attended the Asia Conference of the IAF in Bangalore. There were delegates from many parts of the world and every corner of Asia. It was 2011, the world was still reeling from the shock of the earthquake and Tsuanami that hit Japan. That conference had a number of facilitators from Japan, who detailed and demonstrated how ‘facilitation’ was getting deployed to rebuild the community in Fukashima. It was a deeply moving and a very thorough experience. The conference provided perspectives, a clutch of skills and a sea of global friendships. I remember leaving that conference thinking if facilitation could aid complex community building work (like the Fukashima example) from the ground up, adapting it to the precincts of organisational realities required a dash of courage and oodles of imagination. Nothing more. In more ways than one, it sparked a fresh bouquet of thoughts and has kept us busy for a long while. Heres some news : The Asia Conference of the IAF is coming back to India ( It went to Schenzen in 2012, Tokyo in 2013, and Singapore in 2014). Sometime in August 2015, Mumbai will play host to the IAF, Asia Conference. Thats the best news I have heard in a long time. Watch this space for more. In the meanwhile, here is Brig.Sushil Bhasin’s generous take on our session. Do read and give him a shout! 🙂 His energy is infectious.